There are two ways to pull writing lessons out of movies. What I typically focus on is looking at what good movies do well, but sometimes it’s just as important to look at what bad movies do poorly. 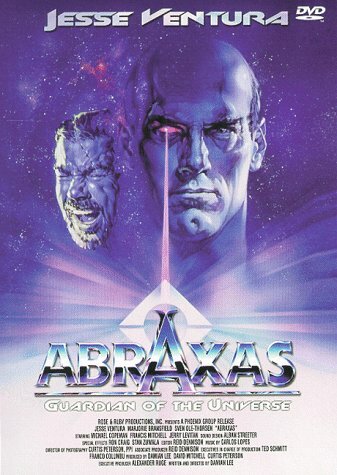 And for that reason I present Abraxas, Guardian of the Universe. This is…not a good movie. It’s a public domain science fiction film from 1991 starring Jesse Ventura as…well, basically the Terminator. I understand the movie does have some defenders who will give reasons that this movie about a quasi-robotic killing machine being sent to kill a young boy has nothing to do with Terminator, and that’s not really the purpose of this post anyway. Don’t write checks your story doesn’t cash. Or, as it’s more frequently put, don’t make promises in your story that you don’t intend to carry through on. Early in the movie the female lead, Jim Belushi’s ex-wife Marjorie Bransfield playing the movie’s far less capable version of Sarah Conner named Sonia, shares a sweet moment with the city-cop-in-the-country Carl. We’ve all seen that moment early on in movies, setting up the couple that is going to come together over the course of the movie, even though he starts the film far too nervous to ask her out. Yes, it’s a cliche. How useful cliches are in movies is a subject for another time. But that’s clearly the plot line being set up for these two characters. But that’s where it ends. Because that’s when Abraxas comes along. The romance between the 10000+ year old alien and the single mother of a potential doom bringer features Ventura not understanding love, wandering in on Sonia in the shower, and at some point learning what this human emotion means and decides that he feels it towards Sonia. It’s the B Plot and really isn’t given enough time to develop as the movie is almost too short for a B Plot of such a theoretical depth. But in the end it means Carl is left out in the cold. And without any real acknowledgement that he was left out in the cold. There’s no moment of “aw man, I wanted to date her,” there was no fighting for her, and there was no follow through on the initial implication that it would be Carl and Sonia ending up together, not Sonia and Abraxas. There was that initial promise, but it was left out to dry with no actual follow through. Now, there’s no reason that a movie that features an awkward desired romance between two characters must result in those two characters ending up together. But this is where the writer has to be aware of cliches. If you don’t want to carry through with a cliche, don’t start the cliche. If you do start the cliche, realize that the audience (whether viewers or readers) are going to expect it to either be brought through to completion, or at least some sort of acknowledgement that this was the route the story was taking. Turning cliches on their head can be a fantastic story-telling opportunity (though in itself can also be a cliche). But starting a cliche just to then drop it? That’s no way to approach a story. Know your cliches, and don’t start anything you don’t plan to finish. And don’t expect Jesse Ventura to carry your movie. This entry was posted on September 6, 2011, 8:52 am and is filed under A Writer Reviews. You can follow any responses to this entry through RSS 2.0. You can leave a response, or trackback from your own site.